When a bird breaks its wing, the bird will be immobilized so that it is not able to fly or may even have trouble moving around. You can help a bird that has a broken wing by nursing the bird back to health and helping to repair the wing. 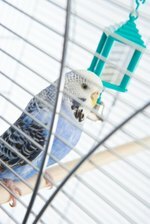 Although you can help a bird with a broken wing yourself, for extreme cases where the bird is badly injured, you should seek the expertise of a professional avian veterinarian. A large bird can cause injury to its handler. Also look to see if there is a wound or the bird is bleeding. Look at the bird's wing to see if it is broken or if the bird is just sick. If the bird's wing is broken, it will hang lower than the bird's other wing or will be hanging in an awkward fashion. Also look to see if there is a wound or the bird is bleeding. If the bird has a wound, you will need to clean it first before you can apply the bandage to the wing. Clean the wound with antibacterial soap. Clean the wound with antibacterial soap and apply styptic powder, cornstarch, flour or baking soda to the wound if it is still bleeding. Apply pressure with a cotton swab until the bleeding stops. Cut 12 to 13 inches of vet tape and place the bird's broken wing against its body in its natural position. Wrap the vet tape on the outside of the bird's wing, around the bird's body and up underneath the bird's functional and healthy wing. Attach the tape to itself so that it is secure. Do not tighten the tape too much or the bird will have trouble breathing. Watch the bird especially carefully when it is getting a drink. Monitor the bird for a while after bandaging its wing so that you can see how it reacts. If the bird topples over, it's okay; it will take time for the bird to get used to using only one wing. Watch the bird especially carefully when it is getting a drink, because if the bird tips into its water bowl, it could drown. Free the bird back into the wild when it is healed. If the bird is still not healed up after a while and you do not want it, try to donate the bird to a pet society or to someone you know.